Since launching Barracuda Backup many years ago, we've added several capabilities that give customers the option to deploy the data protection strategy that best fits their own unique business environments. Barracuda LiveBoot, Cloud-to-Cloud backup, and SharePoint Online Backup are just some of the exciting and innovative technologies we've introduced over the years. Now we're taking another step forward by adding support for replication to Amazon Web Services (AWS). Take a look at our press release here and our corporate site here for details. Barracuda Backup has supported secure and efficient offsite data replication for several years. Customers could configure replication to the Barracuda Cloud or to an offsite Barracuda Backup physical or virtual appliance. This met the needs of customers who either had no additional Barracuda Backup appliance or who are required to maintain strict ownership of data. With our new support for replication to AWS, our customers can now meet these needs by replicating to their own AWS Simple Storage Service (S3) bucket. This is possible because Barracuda continues to invest in the public cloud. Our engineers have deployed and fully integrated Barracuda Cloud infrastructure components into the AWS architecture. There is very little setup and configuration for the customers on the Barracuda Backup, and the customers do not have any cloud-side tuning at all. So how does this really help you, the Barracuda Backup customer? 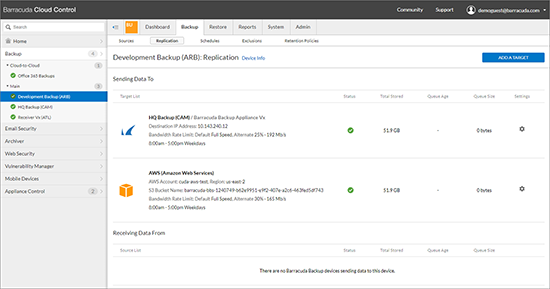 As I mentioned above, customers who need to maintain strict control and ownership over data can now replicate from Barracuda Backup to an S3 bucket. AWS customers have complete control over their assets in the public cloud, all the way down to the geographic location of where the S3 bucket resides. If you are restricted by compliance issues, this option may simplify your infrastructure and cut costs on your data protection. If you are running an on-premises or hybrid infrastructure right now, you are probably thinking about moving more of your resources to the public cloud. Replicating your data to the public cloud is an easy way to get started or to check another migration task off your list. Customers with a basic understanding of AWS will be able to deploy this configuration within minutes. There is no need to deploy compute resources in the cloud for this task. For detailed information on how to configure AWS replication and restore, visit Barracuda Campus here. AWS and other public cloud platforms have a standardized set of protocols when it comes to supporting businesses and securing the cloud. Replication to the public cloud means that your data protection processes can deliver the same levels of accessibility and availability as your other public cloud workloads. Barracuda disaster recovery features allow you to fire up a copy of a protected server in another environment should you lose on-premises connectivity or power. In this case, customers replicating to AWS have the option to restore their protected virtualized systems directly to their own AWS EC2 compute environment. This rapid recovery capability can keep you and your business going during a catastrophic event at your location. With your data replicated to the public cloud, your backups are available whenever, wherever you are. 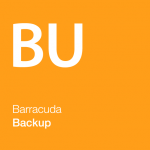 If you'd like to give Barracuda Backup a try, visit our corporate site here for more information. You can also request a risk-free 30 day trial of most products, including the latest versions of our data protection solutions.